Dialogue: A Conversation with Ferrell Jenkins in The Christian Chronicle on non-institutional churches. Jenkins, in his Tampa, Fla., office, holds a Herodian lamp. 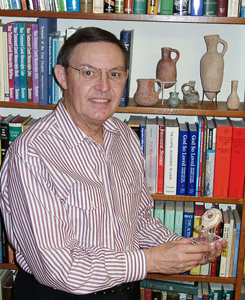 Jenkins frequently uses pottery and coins collected from his travels in Bible lands to illustrate lessons. They meet in well-kept church buildings  the ones with no fellowship halls. They're the non-institutional churches of Christ. Today they number about 2,000 churches with roughly 132,890 in attendance. To members of "institutional" or "mainstream" churches of Christ, these congregations are a source of confusion. "They don't support missionaries" or "They don't believe in kitchens" are common misunderstandings. Shedding light on the matter is William Ferrell Jenkins, retired chair of the Department of Biblical Studies at Florida College, Temple Terrace, Fla., a school associated with non-institutional churches. He is minister at the Church of Christ at Carrollwood, Tampa. A preacher for 50 years and author of study guides on theology, Jenkins has established two Web sites with study material (www.biblicalstudies.info and www.bible world.com). He has organized study tours around the globe since 1967. Jenkins' former colleagues in biblical studies presented him a festschrift at the 2002 Florida College lectures. The 379-page volume, "God So Loved: Studies in the Gospel of John," is a collection of 23 scholarly and practical essays on the gospel of John, one of the courses Jenkins taught. Who are the churches described by Mac Lynn as "non-institutional," or "NI," in his book "Churches of Christ in the United States?" How do they differ from mainstream churches of Christ? What do the two groups have in common? At first the differences mainly were over church support of private institutions such as orphan homes and colleges. Non-institutional brethren emphasized that the church is able to do its work without making contributions to support institutions apart from the church. The sponsoring church was a big issue. NI churches thought that each church should do its own work and that no church has the right to become the sponsor of a work in evangelism, benevolence or edification and expect other churches to send funds to it. For many years brethren discussed the scriptures which each saw as the basis for his beliefs. To many of us, it became evident that a new way of looking at scripture was developing. We held that the Bible directs in three ways: direct command or precept, approved examples and necessary inference or conclusion. When some institutional brethren began to defend their practices in such lessons as "Where There Is No Pattern," it became evident that we had a different understanding of how the Bible directs us. At first the differences could be seen only by looking at the monthly financial statement. Did the church support, or not, this or that institution or a sponsoring church? After a while participation in social activities came to be another distinguishing mark. Fellowship halls, kitchens and recreational activities came to be tell-tale signs of "liberalism." The churches still had a lot in common, but the differences were too great for the NI brethren to overlook. Fellowship between the two groups is practically nil today. Discuss the term, "non-institutional." Is it accurate? Well, it''s better than "antis." Of course, we would prefer to be called Christians. I have no idea who first used the term "non-institutional" but it has become quite common. It means that these churches do not support the institutions that are commonly supported by the "mainline" congregations. I prefer the terms "institutional" and "non-institutional" over "liberal" and "conservative," or "liberal" and "anti." What philosophies or elements of the Restoration tradition influenced this movement's formation? I see the Restoration appeal as valid because it is based on a return to the New Testament. In my book, "The Early Church," I have tried to set forth the church of the New Testament. (Historian) Richard Hughes points out that "those who opposed the development of institutions stood squarely in the democratic, anti-institutional mainstream of their 19th century heritage, contrary to the assertions of mainstream Churches of Christ that they were deviants, radicals, and schismatics" (in his book, "Reviving the Ancient Faith"). He says that it was the mainstream "that had removed itself almost entirely from its 19th century roots." What do you feel are the biggest misconceptions people have about these churches? How do church members combat these notions? For many years it was that pejorative term "anti" that influenced many members of mainline churches to misunderstand us. We were said to be anti-orphan, anti-mission work and willing to let a non-Christian starve on the doorstep of the church building. Some lumped us with "anti-class" brethren. Because we opposed the sponsoring church in evangelism, we were called anti-cooperation. We insisted that churches could cooperate without pooling their resources through a sponsoring church. We seek to combat these misunderstandings the same way we correct misunderstanding among denominational groups about the necessity of baptism and the organization and work of the church. We just keep teaching. How do these churches do missions, domestic and foreign? Most of us would say that we do it just as New Testament churches did. Preachers are sent, or funds are sent to preachers. The early church was able to preach the gospel without forming missionary societies and without allowing some of the churches to become sponsoring churches through which the others might work. We find a pattern for imitation in passages such as Phil. 4:15-16 and 2 Cor. 11:8-9. I think our biggest problem these days is not in finding funding but in having enough men willing to go into the field. What distinctive doctrines should we, as Christians, be discussing today? How would these churches define salvation issues? We need to be proclaiming the good news about Jesus to a lost and dying world. Generally, I think we fail to understand our society and its cultural values. About the time we become comfortable responding to a philosophical or cultural approach it has become passéé and we are still behind. By the time some of us learned how to respond to classical liberalism, modernism and neo-orthodoxy, we discovered that we were living in a post-modern world. We do need to preach the distinctive nature of the New Testament church and how it differs from modern denominationalism. We need to teach respect for Bible authority by teaching how to establish Bible authority, which is the foundation the Restoration principle. In "Biblical Authority" I have set forth the hermeneutical principles commonly acknowledged by NI churches. My knowledge of what is going on in mainline churches is limited, but I assume that most of us are still teaching the necessity of faith, repentance, confession and baptism for the forgiveness of sins as the way of salvation. This is certainly what we find among NI churches. How can these congregations grow in the midst of the community church movement and distractions that take people away from traditional practices? Do you think non-institutional churches are growing? Well, it is difficult. The community church movement is able to poll a community and then offer what it wants. Our responsibility is to try to show people their condition apart from Christ and to lead them to obey Him. There are exceptions, but my observation is that most of these churches (non-institutional) seem to be "maintaining" rather than growing. How should churches go about involving young people, who are often attracted to large congregations which offer college and singles ministries? We see this as the responsibility of the homes, and many Christians are doing an admirable job of providing activities for the young people. The challenge and joy of learning and doing God''s will keeps young people, as well as older people, involved in spiritual activity. We believe that social and recreational opportunities, which are important, should be provided by individuals. This article appeared in The Christian Chronicle, June, 2002, as one in a series of Dialogues. The entire series may be found online at The Christian Chronicle. The Christian Chronicle is a monthly newspaper published by members of the mainline churches of Christ. Due to space considerations, one of the questions I answered was not included in the article. I will include it here because I think it will be of interest to some readers. What were the historic Dallas and Nashville meetings? About thirty brethren met to discuss the issues in Nashville in 1988. Another meeting was held in Dallas two years later. Topics included historical perspectives, scriptural hermeneutics, congregational versus individual action, work of the local church, cooperation of churches, churches and institutions, and fellowship. The Arlington Meeting (1968) had been limited to the participants in a retreat-like setting, but the Nashville and Dallas meetings were open to anyone interested. I recall that about 800 gathered in Nashville, and a similar number in Dallas. A good spirit prevailed and there seemed to be a general disregard for the sectarian spirit which sometimes characterizes brethren.